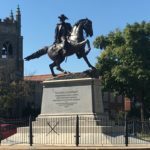 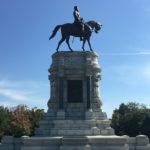 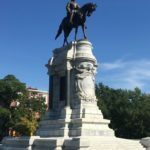 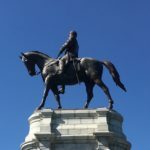 Recently I had the pleasure of exploring the great city of Richmond Virginia, the first stop driving up from Florida was in Georgia with a stop at Stone Mountain….but I’ll talk more about that in another post. 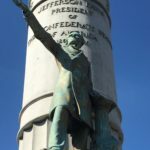 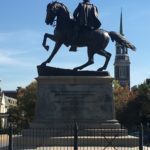 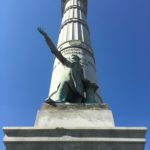 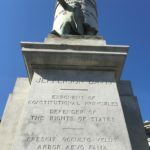 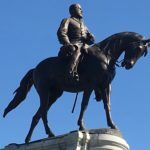 My concern these days is that Southern Landmarks will be torn down and placed in the Monument Grave yard…..I’m hoping fair minded people can have open discussions and figure out a way to leave the monuments and landmarks without the knee jerk mod mentality reactions that we’ve seen recently. 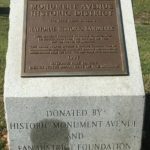 At the far eastern end of Monument Avenue is a traffic circle known as Stuart Circle. 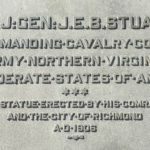 The J.E.B. 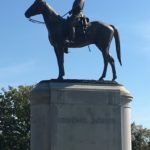 Stuart Monument has Stuart turned in the saddle facing east while the horse faces north, the equestrian bronze perched upon a granite base. 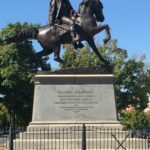 The statue was sculpted by Fred Moynihan of New York and was unveiled May 30, 1907 making it the second Monument unveiled on Monument Avenue. 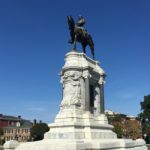 The Robert E. Lee Monument was the first and the largest of all Monuments on Monument Avenue in Richmond Virginia. 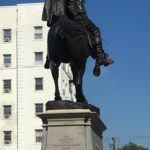 The Lee Monument association commissioned the adaption of a painting by artist Adalbert Volck into a lithograph, depicting Robert E. Lee on his horse. 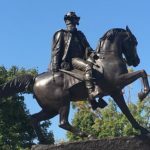 The bronze was created by French sculptor Antonin Mercie. 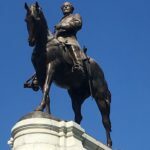 Apparently Antonin didn’t think that Lee’s horse “Traveler” was the right scale for his sculpture so in place of Traveler he used a larger scale horse, which many have criticized him for….after all Traveler is/was revered by many in the south……Robert E. Lee said on more then one occasion how fond he was of Traveler. 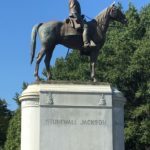 The completed statue was unveiled May 29, 1890. 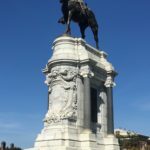 The entire Monument stands 60’ tall with Lee and his horse measuring about 14’. 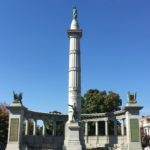 The Davis Monument is located four blocks west of Lee Circle, with its tall central column surrounded by a Doric colonnade makes it an impressive landmark, the Davis Monument was unveiled June 3rd 1907. 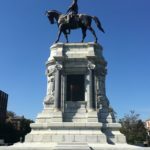 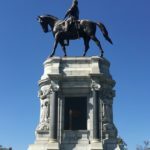 The Daughters of the Confederacy commissioned the prolific sculptor Edward Valentine who also was the artist who did the Recumbent Lee marble and the Stonewall Jackson Bronze both in Lexington Virginia as well as the Thomas Jefferson Marble located at Jefferson Hotel in Richmond Virginia…..just to name a few. 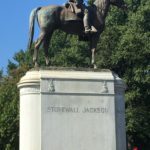 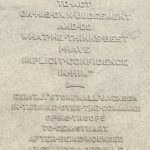 The Stonewall Jackson Monument is located three blocks west of the Davis Monument. 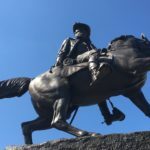 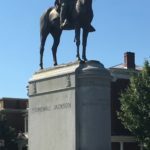 The equestrian bronze figure has the galant General Jackson atop his horse “Sorrel” facing North keeping an watchful eye on the Union invaders. 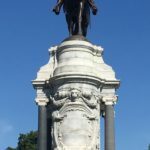 Artist William F. Sievers was commissioned by the Daughters of the Confederacy and the monument was dedicated October 11, 1919 at a cost of $40,000. 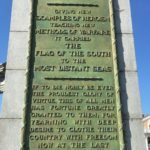 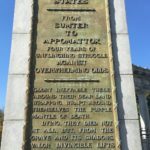 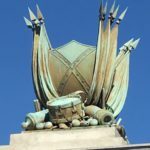 The monument stands a total of 38’ tall with the bronze sculpture measuring 17.5’ and the oval marble base measuring 20.5’.